There is not enough room for wisdom teeth to erupt properly. The wisdom teeth only partially erupt, which can increase chances of infection. Malalignment of wisdom teeth can cause crowding or even damage to the teeth in front of them. A cyst (fluid-filled sac) is present on a wisdom tooth. Wisdom teeth are the most common teeth to cause cysts, which typically require removal of the teeth to remove the cyst. The lower wisdom teeth can sometimes cause overgrowth of gums over the teeth, which can lead to pericoronitis. Pericoronitis is an infection that frequently causes intense pain, offensive smells, and even limited mouth opening. 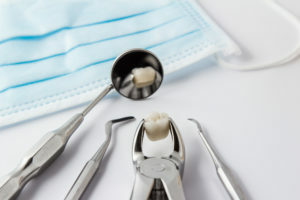 Wisdom teeth extractions can occasionally be simple procedures, especially if the wisdom teeth are fully erupted and don’t have long or curved roots. If the teeth are fully or partially covered by bone, the teeth may take a little longer to remove. In most of these impacted wisdom teeth cases, Dr. Street may recommend you to an Oral Surgeon to have the teeth removed. An Oral Surgeon can even use general anesthesia so that the patient will be “asleep” for the procedure. For non-impacted wisdom teeth removal, Dr. Street will use local anesthetic injections (“shots”), which numb up sensations so that the patient does not feel sharp pain. Nitrous oxide (also known as laughing gas) can also be used to relax patients having extractions performed at Dr. Street’s office. A thorough understanding of the patient’s health, past surgeries, and current medications is necessary before performing an extraction. Once the tooth is extracted, the socket where the tooth root used to be needs time to heal. This healing involves forming a blood clot in the extraction site, which promotes bone and gum tissue to form over time. A “dry socket” is an unpleasant complication that can occur if the blot clot fails to form or dislodges before the extraction site has healed. With modern tooth extraction procedures and recommended follow-up care, a tooth extraction can be a simple and painless process.